Critically acclaimed performer Jon McKiel returns to the live stage on October 5, releasing his anticipated second album ‘The Nature of Things’ at the Marquee Club, Halifax, with Calgary group The Cape May and Montreal singer-songwriter Jason Bajada. McKiel and his four-piece band recorded the 10-track album at Fort Apache Studios in Boston where such acts as Radiohead (The Bends), Dinosaur Jr. (Green Mind), and the Pixies (Come On Pilgrim) laid down material. The Halifax-based musician signed a two-album record deal with Wednesday Records in California after the success of his self-titled debut. 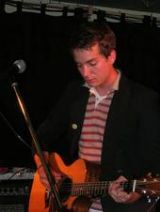 Where McKiel's first album introduced an indie-rock talent who possessed rare lyrical sensibilities and ability to craft subtle melodies ‘The Nature of Things’ expands on those musical characteristics, layering guitars, incorporating horns and keyboards, and driving percussion as the backdrop to the descriptive and introspective lyrics, adding a haunting atmosphere reminiscent of Broken Social Scene and Hayden. The record was mastered at Lacquer Channel Studios by Noah Mintz (The Dears, Stars, and BSS). Songs such as album-opener “War On You,” “Walking With The Dead,” and “Land of Sand” build slowly and deliberately, with heavy guitars that never overwhelm, instead adding weight to the insightful wordplay. Melodies abound on tracks such as “123 My Friends” and “Somebody's Listening” that update the classic mid-90s Halifax sound for a younger generation. “Poor Heart,” “Get Caught,” and “Sleep Cities” are example of singer-songwriter vulnerability done with alarming and breathtaking poignancy. Following the release of that album, McKiel earned three nominations at Music Nova Scotia Week for Male Recording, New Artist, and Alternative Recording of the Year. Jon McKiel charted at No. 12 at CKDU for three weeks and he and his band went on to tour with the likes of Joel Plaskett, Brian Borcherdt, and Cuff the Duke as well as showcasing at the Halifax Pop Explosion.